ALL AMERICAN (AUS) (Brown 2005-Stud 2010). 4 wins-3 at 2, VRC Emirates S., Gr.1. Sire of 241 rnrs, 116 wnrs, inc. SW Yankee Rose (ATC Sires' Produce S, Gr.1), Bachman, Zebulon, America Mon Amie, SP American Genius, Sam's Image, All Out of Love, Rampage, Tender and of Crockett, Phelps Glory, Green Card, Invisible, Lady Trickster, Chicago Nights, Elusive State, Yankee Express, American Star, General Wind - Kolombia (Sing. ), Jill's Charm, etc. Green Card (g. by All American). 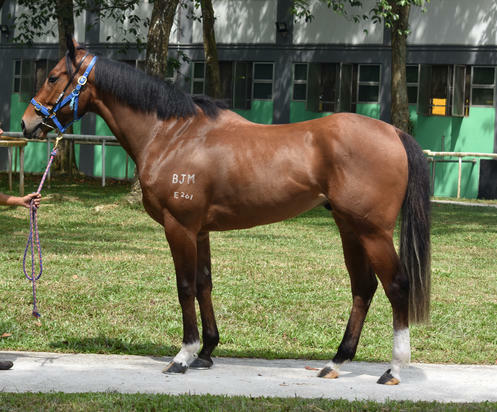 4 wins-2 at 2-to 1400m, A$101,375, HK$3,448,600, to 2017-18, MRC Ted Rainford 2YO P., HKJC Woodpecker H., Tsuen Fu H., 2d HKJC Yin Kong H., Indian Ocean H., Mr Medici H., Kings Falcon H., Atlantic Ocean H., 3d HKJC Mui Wo H., Sports Without Borders H.
Green Light (g. by All American). 2 wins at 1000m, 1500m in 2016-17 in Aust. Cristallo (Testa Rossa). Winner. See above. We Own an Angel. 2 wins at 1000m, MRC (Mornington) NJT T20 Cricket Match P., 2d MRC Land Engineering H.
The Unforgiven. 3 wins from 1100m to 1600m in Aust. Out of Italy. Winner at 1400m in Aust. Vancenzo. Winner at 1600m in Aust. La Bellarina. Winner at 1400m, STC Chemsave Wentworthville H., 2d STC Special Membership Offer H., 3d STC Toongabbie P.
DR GRACE (Sir Tristram). Joint Head of The 1989-90 Australasian 3YO Classification. 12 wins-2 at 2-from 1200m to 2400m, A$2,759,803, STC BMW S., Gr.1, AJC Derby, Gr.1, AJC Chipping Norton S., Gr.1, VATC Underwood S., Gr.1, NSW Tatt's RC Chelmsford S., Gr.2, VATC JJ Liston S., Gr.2, 2d Moonee Valley S., Gr.2, Queensland Guineas, Gr.2, 3d Victoria Derby, Gr.1, AJC Chipping Norton S., Gr.1, QTC Castlemaine S.H., Gr.1, STC Ranvet S., Gr.1. Sire. ASIA (Danehill). Winner at 2500m, A$342,260, South Australian Oaks, Gr.1, 2d STC Canterbury Cup, Gr.3, AJC Cyprus H., City Tatt's RC Club H., 3d AJC Australian Oaks, Gr.1, Chairman's H., Gr.2, Clarence River JC Grafton Cup, Gr.3, Coffs Harbour Cup, 4th SAJC Australasian Oaks, Gr.1, STC Ansett Australia S., Gr.1, Hill S., Gr.2, Winter Cup, L.
LATE CHARGE (Hard Spun). 4 wins-2 at 2-at 1200m, 1400m, A$253,400, VRC Sofitel H., L, 3d MRC Autumn S., Gr.2. Hunka's Tribe (Hunka Papa). Winner at 2, AJC Divide & Rule H., 2d South Australian Derby, Gr.1, 3d STC Gloaming S., Gr.2. WHITEFRIARS (Arena). 6 wins-1 at 2-to 1200m, A$619,215, MVRC Australia S., Gr.2, VRC Seppelt Salinger S., Gr.2, City Tatt's RC Lightning H., L, 1100m-in track record time, 2d AJC Shorts H., Gr.2, Stan Fox S., Gr.2, San Domenico S., Gr.3, STC Canterbury Classic, L, 3d WATC Winterbottom S., Gr.2. CALVEEN (Canny Lad). Champion Sprinter, Miler & Older Female Miler in NZ in 2004-05. 10 wins at 1400m, 1600m, NZ$404,015, A$146,750, ARC Easter H., Gr.1, BOP RC Japan-New Zealand International Trophy, Gr.2, Cambridge JC Travis S., Gr.2, Counties RC Auckland Thoroughbred Breeders' S., Gr.2, Waikato RC Gasmate S., Gr.2, Gasmate S., Gr.3, Avondale JC Photofinish.co.nz H., Waikato RC Waikato Stud H., 2d MRC Victoria H., Gr.3, VRC Bobbie Lewis H., Gr.3, 3d MRC Toorak H., Gr.1, ARC Rich Hill Mile, Gr.2. Producer. KOSI BAY (Spinning World). 4 wins from 1400m to 1900m, A$336,075, AJC Emancipation S., Gr.2, STC Epona S., L, AJC Campbell's Cash & Carry H., 2d AJC Emancipation S., Gr.2, 3d VRC Myer Classic, Gr.1, STC Canterbury S., Gr.2, AJC Japan Racing Association P., L, 4th MRC Eclipse S., Gr.3. Producer. FIREWORKS (Snitzel). Winner at 2, A$152,000, ATC Widden S., Gr.3, 3d ATC Reisling S., Gr.2, Hyland Race Colours 2YO P., 4th ATC Stan Fox S., Gr.2. ONE FOR ONE - HINYUEN SWIFTNESS (H.K.) (Duke of Marmalade). 3 wins to 1500m, A$128,600, VRC Poseidon S., L, 3d SAJC Morphettville Guineas, L.
EKTIFAA (More Than Ready). 4 wins to 1450m, R565,000, in 2016-17, Kenilworth Choice Carriers Championship, Gr.2, Turffontein Tony Ruffel S., Gr.3, Spectracare H.